This is a super easy activity and a great life skill for children to learn. Lets be honest, having help with grouping socks on laundry day is never going to be a bad thing! 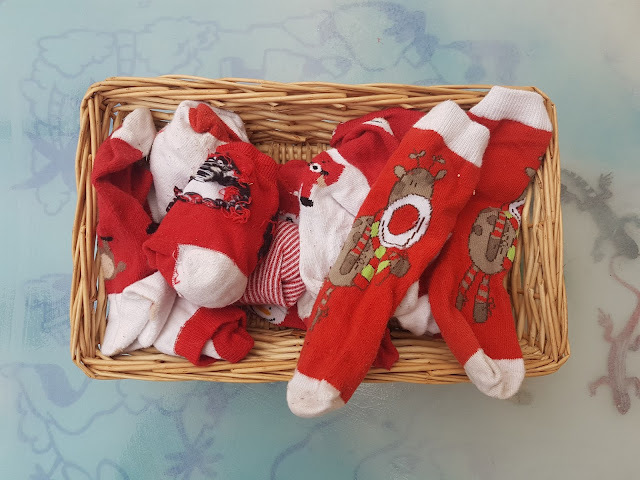 I picked up a set of cheap baby Christmas socks.I got this bundle from Ebay but I have seen sets in cheap high street shops and individual pairs sold in the pound shop. Sit down with your child and lay out the socks. Ask them to find 2 socks that match and pass them to you. Once they have found a matching pair place them to pone side together. As a progression to this activity and for slightly older children you can provide laundry pegs and ask them to peg them in pars. Then progress to bunching them together as if they were being sorted to put away. This activity can grow with these slight adaptations for different ages of children in your setting. It also provides a level of development for individuals that would like to try the slightly more challenging ways of joining the socks. It is also fun to set up a little washing line and let the children peg them along the line in pairs. Grouping and matching skills are important for early mathematical thinking and will help children recognize similarities and differences.